Bummer In The Bowl: Underwhelming Performances Rule The Night At The Hollywood Bowl Summer Close Out. Only Warpaint Truly Shines. TV On The Radio in the middle of their dreadfully mixed show. Look, playing the Hollywood Bowl is a daunting, difficult task for any rock 'n' roll artist. Saddled with strict curfews and volume limitations that inhibit spontaneity, and designed for a picnicking classical audience far less concerned with the visual components of a performance, the expansive Bowl is the farthest thing from intimate...even seats in the front third of the arena, where I was seated, feel like they're positioned a mile away. Throw in the typically aloof, rudely chatty, Hollywood hipster crowd, and you've got a nightmare scenario for any band. But over the years, I've seen many acts transcend this venue's hurdles. Unfortunately, this would not be one of those nights. Chicago's Smith Westerns took the stage promptly at six p.m., and immediately set the tone for a disappointing evening. Launching into a five song set of material from their latest release Dye It Blonde, they sounded decent enough, but had zero stage presence, and seemed overwhelmed by the scale of the environment. I don't think the bassist or drummer mustered the courage to look up at the vast audience even once. One's tempted to grant the band a pass, given their youth and especially the possibility of lingering psychological trauma stemming from the Pukkelpop stage collapse tragedy they were witness to this summer, but no matter how you slice it, this was just not an impressive set. Warpaint delivers the evening's one thrilling set. As soon as they scampered off, the central portion of the stage rotated 180%, bringing Warpaint out to face the crowd. Luckily, theirs would be the one fabulous set of the night, though maybe not fabulous enough for actor Peter Sarsgaard. That's him standing in the blue windbreaker in the photo to the left. In typical, too-cool-to-care, Hollywood fashion, he spent the whole Warpaint set standing with his back to the stage, more interested in doling out wine and baguettes for friends in the row behind him than the killer music being produced below. Quite simply, they crushed it. Opener Set Your Arms Down immediately established that the great separation of sound they achieved back at Coachella was no accident...they sounded almost as good here. Then after another strong track from their debut The Fool, they kicked it up several notches with lead single Undertow, which was mesmerizing, easily the best single song performance of the entire evening. Maintaining their heightened peak, they closed with a new song, a lengthy jam that swelled and soared through multiple passages, and which they continued to play even as the central turret rotated them out of sight. A brief intermission followed, and then Panda Bear took the stage. Now, truth be told, I'm hardly the biggest Panda Bear/Animal Collective fan, but as far as he/they go, on a musical level, this set wasn't half bad...far more compelling a listen than Animal Collective's horrendous Coachella set five months back. His voice was impressive, and the six song setlist couldn't have been stronger, closing out with Tomboy's two best tracks, Last Night At The Getty and Afterburner, and then two of Person Pitch's best tracks, Comfy In Nautica and an abbreviated version of Bros. But all of my fundamental issues with the Panda Bear / Animal Collective approach remained. Despite the often childlike positivity of their music, he / they are amongst the most disengaged and joyless of contemporary live performers. Hiding behind a phalanx of sequencers with fellow "press play" artist Sonic Boom, and backed by another dated, cliche stream of hippie-blip videos, there was zero effort on his part to connect on any personal level with the audience. No banter, no acknowledgement other than a thank you at the end, not even a smile or a frown. Just the music, which for me, at least, wasn't enough. And this isn't a case of just being green and nervous and still needing time to season as it was with Smith Westerns, or a genuine exploitation of non-interaction to heighten the mystery, as one gets with My Bloody Valentine; with Panda Bear, it feels like genuine disinterest. Which leads me to a very pointed philosophical artistic question - if connecting with one's audience in a live setting means so little, and you've already established yourself as a top tier album artist with a passionate following, aside from the money, why perform at all? I probably just answered the question myself, but you get the gist of Panda's set - interesting sounds, zero heart. Arctic Monkeys were up next, and their hour long set was without question the second best of the night. Tossing out an eclectic mix of cuts from each of their four albums, they played with fine energy, and lead singer Alex Turner was far and away the evening's most engaging frontman, frequently stopping between songs to inquire "So how we doing, Bowl?" Really only had two issues with their set. First, the Bowl is just the wrong venue to see a band such as this...the vast open air over magnified the choppy rawness of their sound. A little echo off interior walls would have gone a long way to blur the amateurish feel of some of their songs. Second, while I respect them for putting together such an unpredictable set list...the number of Arctic Monkey songs I hoped to hear but didn't (Dancing Shoes, Riot Van, Fake Tales Of San Francisco, Do The Bad Thing, 505 to name just a few omissions) was much longer than the number of Arctic Monkey songs I hoped to hear and did. But still, a number of engaging efforts in their sixty minute span, of which I probably enjoyed Do Me A Favour best. Finally, it was time for TV On The Radio, and within the first fifteen seconds, all I could think was, "Will this amazing studio band ever learn how to properly mix their shows?" Seriously...through their first three numbers, which included Cookie Mountain's Blues From Down Here and Dear Science,'s Dancing Choose...the mix was beyond awful. Which to me is a pure shame. We're talking about one of the premiere album acts of the last half-decade, blessed with a world of passion, originality, tremendous songs, and two of the most idiosyncratically compelling singers around in Kyp Malone and Tunde Adebimpe. And their energy level on this night was superb, which is why these never ending live mix issues that have haunted the band for years are so damn frustrating. For most of the night, all one could hear clearly were the drums and the drone from Dave Sitak's buzzsaw guitar. Kyp and Tunde's vocals barely cut through, and the trombonists brought in to add a touch of brass would have been better of going to bed...over twelve songs, I think I only clearly heard the trombone once. The show's saving grace the band's latest album, Nine Types Of Light. Brighter, cleaner, and less reliant on textural drones than TV On The Radio's previous releases, the material from Nine Types cut through with a clarity the older material lacked. And while I wasn't crazy about the specific choices from this album, picking weaker tracks like Cannonball, Will Do, and Forgotten over the much stronger Keep Your Heart, You, No Future Shock and Killer Crane, they were welcome respites from the show's overall wall of sludge nonetheless. Oh, and as always, no matter how bad the mix, Wolf Like Me destroyed. It's early a.m Sunday morning, the kids and Nancy are asleep, and I am psyched! First, heading off tonight with Nancy and two great friends to catch The Hollywood Bowl's final rock extravaganza of the summer, featuring two acts I've never caught before...Chicago's Smith Westerns and the England's Arctic Monkeys...and three I can't wait to see again...Warpaint, Panda Bear, and TV On The Radio. Well, actually, if Panda's as lame as Animal Collective was at this year's Coachella, I can definitely wait to see him again, but what the hell, it's a great overall bill...why complain. And contrary to my normal operating speed, I'll try to have a full review up before end of day tomorrow. Second, I'm psyched because I finally loaded the last 2010 release I plan on reviewing into my car rotation. Nothing but 2011s from here on out, though will definitely not overextend myself as much as I did in 2010. Mix collection fans...it's only going to be eight CDs this year max. I'd apologize, but I think most of you have been waiting years for me to trim it down to a smaller, more manageable size. Got in first serious listens on several 2011's this week. Duran Duran's latest, the aforementioned Smith Western's Dye It Blonde, Kurt Vile's hazy Smoke Ring For My Halo (definitely the class of this group), and a few older classics, most notably The Streets' fantastic grime rap debut Original Pirate Material, but the band that was most on my mind, not surprisingly, was R.E.M., who finally called it quits this week after a thirty-one year career. As the years go on, I fear R.E.M. is one of those truly great bands, like the Kinks, that history will tend to forget alongside the other giants of their era. Like the Kinks, their greatest strength was their stunning consistency, but also like the Kinks, and unlike bands such as The Beatles, The Who, The Rolling Stones, U2, or Bruce Springsteen...they never produced that one towering monstrosity...the Sgt. Peppers, The Exile, The Joshua Tree, the Who's Next, the Born To Run...that will ensure they are forever a part of future rock 'n' roll conversations. But with efforts like Murmur, Life's Rich Pageant, and Automatic For The People they came damn close, and in their heyday, from their inception until Bill Berry's on-stage aneurysm in 1995, they were the most reliable crafters of the "never skip a track" front-to-back listen popular music had out there. Even their slight missteps, which for some odd reason always seemed to come on their third release in a sequence (Fables, Green, Monster) held more great tracks than a lot of today's bands generate throughout their careers. For me, coming of age in the eighties, they are a band deeply intertwined with vivid personal memories...the soundtrack to numerous road trips, bar outings, romantic hookups, and 4 am hang-outs with my best college friends. They were a band everyone seemed to love, and yet, on each album, you knew there would be that B-side gem no one else talked about that felt like it had been crafted just for you...Sitting Still, Letter Never Sent, Life And How To Live It, Hyena, The Wrong Child, Near Wild Heaven, New Test Leper...I can't think of another band in rock history that produced such a vast collection of unforgettable "smaller" songs. My guess is history will probably judge Murmur, which basically launched the college/alternative rock genre, the harder-rocking, de-mumbled Document, or the incredibly intimate Automatic For The People as their crowning achievement, but for me it's always been Pageant...with its fabulous Begin The Begin/Superman bookends, and the finest vocal blend Michael Stipe and Mike Mills ever achieved on record, I feel it's the album that best personifies the band's very special chemistry. It's sad to see them go, though given their more recent, post-Berry output, it was clearly time. I just hope they haven't ruled out a headlining original line-up Coachella reunion a few years down the road. Instantly recalling the sound of early country rock classics like The Byrds' Sweetheart Of The Radio or Gram Parson's Grievous Angel, but adding in a contemporary lyrical spin, Phosphorescent's Here's To Taking It Easy is a relaxed, hugely agreeable album that fully lives up to its name. And at the center of it all is idiosyncratic songwriter Matthew Houck. Possessed of a droll wit and a voice that is a dead mix of Parson's warm tones and Roger McGuinn's otherworldly twange, Houck has been releasing records under the Phosphorescent moniker since 2003, but Here's To Taking It Easy is his first outing with a full band. From the very onset, though, it becomes clear that musical chemistry will not be a problem. The ramshackle It's Hard To Be Humble (When You're From Alabama) is a wonderful, fiesty opener, and things get even better with the drawling Nothing Was Stolen, a celebration of love's never ending awkwardness, which offers up sly self-deprecations like "Well apart from the things I touched / nothing got broke all that much." From there the album touches on all manner of present day heartbreak, joy, and irritation, sustained throughout by its irresistable pedal steel churn and Houck's dry humor, which manage to turn even obvious throwaways like Hej, I'm Light and I Don't Care If There's Cursing into fully engaging numbers. I do have a few issues. The record could have been sequenced better, it burns through all of its best material by its midpoint, and some of the instrumental breaks underwhelm, the band seeming to lose confidence when untethered from its primary drivers, Houck's lyrics and voice. But overall, if you've got any taste for good, old-fashioned country rock, Here's To Taking It Easy will prove near impossible not to like. Cherry Picker's Best Bets: It's Hard To Be Humble (When You're From Alabama), Nothing Was Stolen (Love Me Foolishly), The Mermaid Parade, I Don't Care If There's Cursing. Here's the official video for the album's rollicking opener It's Hard To Be Humble (When You're From Alabama). 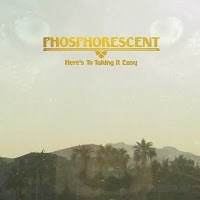 What are your thoughts on Phosphorescent's Here's To Taking It Easy? Let reader's know. 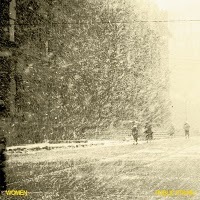 Jagged, degraded, and remarkably unpredictable, Women's second LP Public Strain is an album that positively luxuriates in its own special brand of beautiful ugliness. In many respects, with its buried, unintelligible, tuneless vocals, sinister drones, rock-bottom base, shrill arpeggio guitar runs, aimless drums, and the occasional burst of sunny 60's harmony, it's a combination of sounds that just shouldn't work. But it does, and for those lucky few strong enough to soldier through multiple listens, a world of indescribable intrigue awaits. In fact, one of Public Strain's most endearing qualities is just how difficult an album it is to pin down. Pre-Daydream Nation Sonic Youth...early Velvet Underground made double primitive...garage gone bad...fussed over no-fi...all of these descriptions have been bandied about in the media, and all point in the right direction, but none quite capture the elusive essence of this Calgary act's effort. If I were to make my own futile attempt, I'd liken listening to Public Strain to hearing a back-of-the-room cassette recording of the cellar-dwelling house band of some grimy, bohemian, SoHo dive circa 1966. And much of Public Strain does sound genuinely awful. But buried amid all those ugly, intentionally amateurish components is the band's shockingly perceptive understanding of musical tension. Just when you think Public Strain will relax, it explodes into a knotty, crazed, intricate burst worthy of Captain Beefheart. Just when you think it's going to hit you with something dark and menacing, it suddenly builds to a climactic accessible catharsis. And it's this intuitive, constant thwarting of the listener's expectation, which is then rewarded with something even more interesting than what was anticipated, that is the primary source of this little album's hypnotic power. So if you are a brave-hearted listener, willing to go to dark and unusual places, trust me here. 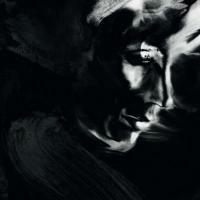 However off-putting it may seem at first, Public Strain is one of 2010's most rewarding listens. Once it sinks in its claws, it will draw you back into its mysterious netherworld again and again and again. Cherry Picker's Best Bets: Heat Distraction, China Steps, Locust Valley, Eyesore. Here's Heat Distraction, my personal favorite from the album. What are your thoughts on Women's Public Strain? Let reader's know! It's been a while since I threw up one of these casual posts, but I heard a few things yesterday that caught my ear, so I thought I would share. On the contemporary front this week, I'm powering through Gold Panda's 2010 release Lucky Shiner and The Rural Alberta Advantage's 2011 offering Departing. Lucky Shiner is decent; easy-on-the-ears electronica with some East Asian accents, a few strong tracks, and a lot of material that just feels par for the course, especially on the album's weaker back half. Departing, on the other hand, is interesting...not great, but interesting. I guess you'd call it folk-rock, but for such spare music, it's got some compellingly conflicting elements...a bedroom indie-pop feel here, an almost punk feel there, and throughout, lead singer Nils Edenloff wails like a dead-ringer for Neutral Milk Hotel's frontman Jeff Mangum. If The King Of Carrot Flowers, Pt. 1 off of NMH's In An Aeroplane Over The Sea was your kind of tune, you should definitely give Departing a listen. Regarding some older releases, was totally digging on Can's 1969 release Monster Movie this morning, their only full release with original lead sing Malcolm Mooney at the helm. It's much more of a straight up rock album than their later efforts, at least straight up as far as Can goes, but well worth checking out if your an adventurous listener interested in one of the 70's most important underground bands. Also went back and gave another listen to My Morning Jacket's It Still Moves, and have to say, wasn't a big fan then and heard nothing to change my mind today. I know a lot of people love this album, and it definitely has its moments, but overall its form of hazy, easy jamming is just a little too hazy and little to easy and way to slow to develop for my tastes. Now Z, that's another story...one of my favorite albums of the 'Aughts. Finally, my apologies, but I will be scaling back on the Amazon links I provide to individual tracks. In a power ploy in this whole online sales tax battle, Amazon has severed all associates contracts for bloggers based in California. So far, I'm still able to generate full album and mix widgets, but the easy individual track linking features Amazon provides seems to have been shut down. Oh well, my guess is 99.999999% of you do your downloading from I-Tunes anyway. Let's drop the critical pretensions. When it comes to my feelings on Destroyer's Kaputt, there's only one thing that needs to be said. I love near everything about it. I love how Dan Bejar has taken the kitschiest R&B and new wave textures of the early 80s and morphed them not only into something constantly enticing, but genuinely cool. I love Kaputt's confident off-hand lyrical flow and unbelievable sound, the way the end of every talk/sung line feels like a launching pad for all manner of magical flourishes, be they driven by shimmering keys, throbbing fretless bass, piercing guitars, Sibel Thrasher's killer backing vocals, or the album's signature electric brass. And I love the album's unrelenting, after-hours romantic warmth. That's not to say Kaputt is perfect. It's not. Closer Bay Of Pigs (Detail), an older Destroyer track that has already been released in other guises over the last few years, feels out of place with the rest of the material, and truth be told, the album does get by more on sound, flow, and vibe than it does on the straight-up strength of its songs. But these are quibbles. 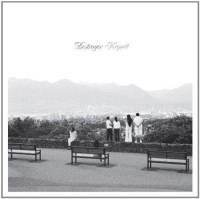 Kaputt is all about the intangilbes, and at the end of the day, a more inviting, relaxing 2011 release does not exist. A lot of acts are presently experimenting with these same nostalgic 80s tones...from Gayngs, Bon Iver and Iron & Wine on the more conventional side, to James Blake, How To Dress Well and Weeknd on the more experimental, but none of these artists have come close to capturing lightning in a bottle the way Dan Bejar has here. Destined to become one of the top make out albums of the next decade, Kaputt is Roxy Music's Avalon reborn...only with Avalon's cold chill replaced by a sly, welcoming smile. Cherry Picker's Best Bets: Blue Eyes , Savage Night At The Opera , Kaputt , Song For America . Here's the very amusing video for the title track. What are your thoughts on Destoyer's Kaputt? Let readers know. Oh, that the album that followed were more like Honey. Dark, sinister, and incredibly atmospheric, armed with a phenomenal, stereo-panning vocal build, it's as compelling an opening track as 2010 produced, and suggests a million music possibilities to come. And then, from that point on, Black City delivers just one. Locking in on slow, moody synth grooves reminiscent of Bowie's late 70s and early 80s work...tracks like Ashes To Ashes , Fashion , Boys Keep Swinging and Cat People (Putting Out The Fire) ...with maybe a touch of that Liars' backing vocal feel from Drum's Not Dead , Black City turns into a dance album with a very distinct sense of place. Every moment feels like a song you'd hear at one of those cliche uber-exclusive clubs depicted in James Bond movies...you know, those urban clubs that only admit the world elite, where every gorgeous patron wears black, and where heinous criminal deeds are perpetrated in every back room. And as far as the album is concerned, this is a good thing. Black City's sense of place and mood is its greatest strength. What kills Black City is its woeful lack of variety. Dear seems to become far too content far too early with what he's created, because basically, a more numbingly repetitive 2010 release does not exist. It's as if once he decided he was satisfied with the album's core sound, the creation of variations in that sound was not required. This doesn't make the album bad, as most of the individual tracks are solid in their cool, decadent, Bowie-esque way, but the cumulative impact of the "same-i-ness" factor is just brutal by the album's back half. Personally, I struggle to stay tuned in much past track four, and I think for some the boredom will set in even earlier. For most listeners then, an MP3 cherry pick is probably the best approach. Grab Honey for sure, and the longest and best dance number Little People (Black City), and then the moody closer Gem. Those are the album's three essentials. After that, it all comes down to how many more variations on Little People you care to hear. Cherry Picker's Best Bets: Honey , Little People (Black City) , More Surgery , Gem . Here's the official video for Slowdance. What are your thoughts on Matthew Dear's Black City? Let readers know.